Situated on Seppeltsfield Road, Seppeltsfield in the internationally acclaimed Barossa Valley is The Lodge Country House. The Barossa Valley is South Australia’s greatest wine region and is only one hour by road from Adelaide. The Lodge Country House is a 100 year old homestead originally built for the Seppelt Family and is located directly opposite Seppelt’s Winery. Set in 3 acres of gardens, the grounds include a lawn tennis court and swimming pool. Your hosts and proprietors are Colin Currie and Phil Preen. 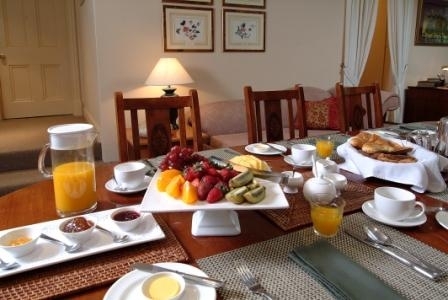 We ensure that your stay with us at The Lodge Country House is a time for relaxing in elegant and comfortable surroundings, with good country food cooked and served by us. We are fully licensed with our own cellar of fine Barossa wines. Luxurious accommodation is provided for 4 special couples. 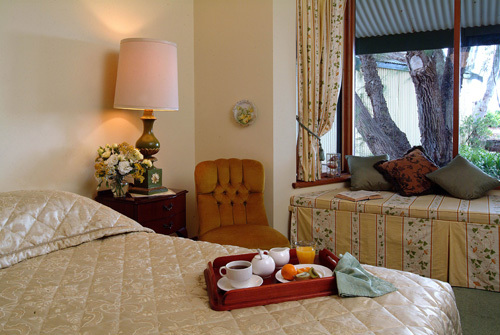 Each room is individually decorated, and has a bay window seat, separate air conditioning and en suite bathroom. Undercover parking is provided for guests’ cars. Inside you will find formal and informal Dining and Sitting rooms. Outside are wide verandahs and a summer house for more casual entertaining. Dinner is served in the formal dining room and features fresh home-grown, local Barossan and South Australian produce. Luxurious accommodation is provided. Your rooms are individually decorated, (2 have a queen bed one with 2 king single beds), a bay window seat, separate air conditioning and en suite bathroom. Inside you will find formal and informal Dining and Sitting rooms. Outside are wide verandahs and a summer house for more casual entertaining. Dinner is served in the formal dining room and features fresh home-grown, local Barossan and South Australian produce. Luxurious accommodation is provided for a special couple. Your room is individually decorated, has a queen bed, a bay window seat, separate air conditioning and en suite bathroom. Inside you will find formal and informal Dining and Sitting rooms. Outside are wide verandahs and a summer house for more casual entertaining. Dinner is served in the formal dining room and features fresh home-grown, local Barossan and South Australian produce. Luxurious accommodation is provided. Your rooms are individually decorated, each has a queen bed, a bay window seat, separate air conditioning and en suite bathroom. Inside you will find formal and informal Dining and Sitting rooms. Outside are wide verandahs and a summer house for more casual entertaining. Dinner is served in the formal dining room and features fresh home-grown, local Barossan and South Australian produce. Luxurious accommodation is provided. Your rooms are individually decorated, ( 3 have a queen bed and one has 2 king single beds), a bay window seat, separate air conditioning and en suite bathroom. Inside you will find formal and informal Dining and Sitting rooms. Outside are wide verandahs and a summer house for more casual entertaining. Dinner is served in the formal dining room and features fresh home-grown, local Barossan and South Australian produce. Luxurious accommodation is provided for one person. Your room is individually decorated, has a king single bed, a bay window seat, separate air conditioning and en suite bathroom. Inside you will find formal and informal Dining and Sitting rooms. Outside are wide verandahs and a summer house for more casual entertaining. Dinner is served in the formal dining room and features fresh home-grown, local Barossan and South Australian produce. Luxurious accommodation is provided for two people. Your room is individually decorated, has a two king single beds, a bay window seat, separate air conditioning and en suite bathroom. Inside you will find formal and informal Dining and Sitting rooms. Outside are wide verandahs and a summer house for more casual entertaining. Dinner is served in the formal dining room and features fresh home-grown, local Barossan and South Australian produce. Luxurious accommodation is provided. Your rooms are individually decorated, (one has a queen bed whilst the other has 2 king single beds), a bay window seat, separate air conditioning and en suite bathroom. Inside you will find formal and informal Dining and Sitting rooms. Outside are wide verandahs and a summer house for more casual entertaining. Dinner is served in the formal dining room and features fresh home-grown, local Barossan and South Australian produce. Luxurious accommodation is provided. Your rooms are individually decorated, has a queen bed, a bay window seat, separate air conditioning and en suite bathroom. Inside you will find formal and informal Dining and Sitting rooms. Outside are wide verandahs and a summer house for more casual entertaining. 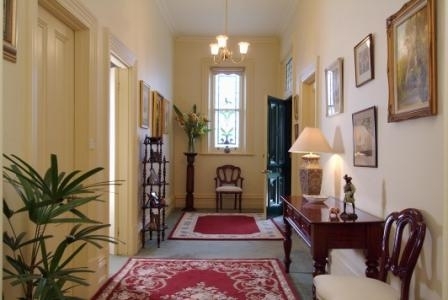 Dinner is served in the formal dining room and features fresh home-grown, local Barossan and South Australian produce.